2 ton gantry crane is a kind of light duty gantry crane and is capable of lifting and moving items up to 2 ton. 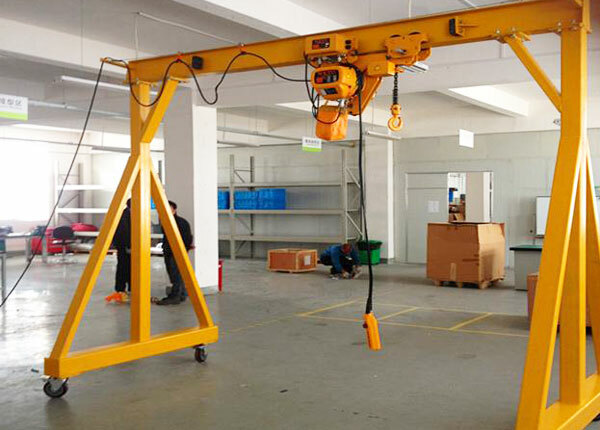 As a small gantry crane, it is widely applied in warehouse, workstation, garage, workshop and other outdoor workplaces to achieve a small lifting requirement. This gantry crane 2 ton typically comes in single girder design and mobile type. The 2 ton portable gantry crane runs on wheels so that it can move freely and reach every corner of the workplace. We also supply gantry crane that travels on tracks of ground, and it can be designed into two types including full gantry crane and semi gantry crane. These different types have their own exceptional advantages, and customers should select the type according to their specific needs. Ellsen has many years of experience in manufacturing 2 ton single girder travelling gantry crane, and we also supply other tonnage including 5 ton, 10 ton, 20 ton, 100 ton and other heavy duty gantry cranes to suit your wide range of applications. How to Choose A Right 2 ton Gantry Crane? 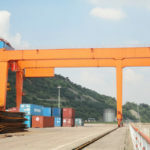 Before selecting 2t gantry crane, you should have a comprehensive understanding of gantry crane type and their differences so as to make the best choice. 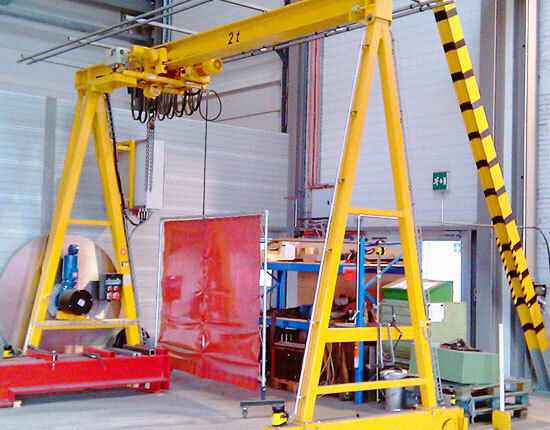 We mainly produce three types of gantry cranes to suit your 2 ton lifting requirement. MH single girder gantry crane is the most common type of 2 ton crane, usually equipped with CD1 and MD1 electric hoist. It runs on tracks laying on the ground and is designed for general use, such as warehouse and open storage yard. This gantry lifting equipment has advantages of simple structure, easy maintenance and light dead weight. BMG semi gantry crane is a type of single leg gantry crane with one side mounted on the track of building walls and the other side supported by two legs, so it can make use of existing facility and reduce come costs. Portable gantry crane has prominent features of high flexibility and mobility. This small mobile gantry crane is widely adopted in shop, workstation and open yard because of its low cost and convenient movement. When selecting an gantry crane 2 ton, you should consider a few things in order to make a right purchase choice. First, you should think about your crane application, that is, where will you use the gantry crane? Is it used to lift heavy loads in a workshop or a workstation? Then you need to consider your 2 ton gantry crane specification to maker sure it is able to undertake the lifting task. Another thing you need to think about is your working conditions, such as your facility space and the environmental condition. And you should also consider some accessories you need to complete the lifting job. For instance, you can choose a wire rope hoist or electric chain hoist to work with your crane. The final consideration is the crane price, service, assembly, etc. If you would like to buy a 2 ton gantry crane, contact us and we will help you select the most suitable crane 2 ton. This small gantry crane usually has low cost compared with other material handling equipment. This equipment can effectively improve your lifting process and help save a lot of time and labor costs. As mentioned above, we supply different types of 2 ton gantry crane for sale. Tell us your requirement for gantry crane including the crane model, specification and usage so that we can offer you the most suitable solution and a reasonable price. 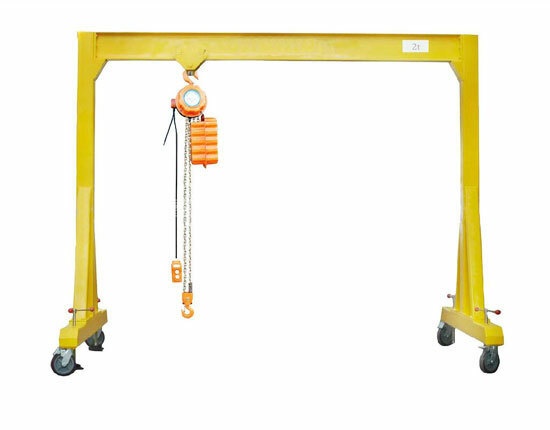 The gantry crane 2t has simple structure and light weight. Some of the cranes can be made of aluminum or steel, which allows the crane to move and be delivered easily. The 2 ton gantry cranes are available in multiple types to meet different requirements, such as fixed type, portable type and adjustable gantry crane. This overhead gantry crane has easy assembly, disassembly and maintenance, so it can be readily relocated in other workplaces. This lifting equipment can achieve a high utilization of working site and a large coverage. Our gantry crane has good adaptability and high versatility. The gantry crane is mainly composed of gantry frame (main beam, legs, lower beam), hoist trolley, running mechanism and electric control system. The hoist trolley which includes lifting mechanism and trolley running mechanism travels along the track on the main beam. The lifting mechanism is one of the most important parts of the crane, which can directly affect the performance and efficiency of your equipment. The running mechanism drives the trolley to move in a high speed in order to achieve high efficiency. The gantry frame is the fundamental part of gantry lifting equipment, and the main beam is usually designed with box type. It can also be outreached at one side or both sides to form a cantilever so as to expand the lifting coverage. The length of cantilever is generally less than one third of the crane span. For the crane running mechanism, it usually falls in rail mounted type and mobile type. According to your practical usage, you can choose full gantry crane with four supporting legs, semi gantry crane or mobile gantry crane. With regard to the operation methods of light gantry crane 2 ton, pendant control or wireless remote control is often adopted to complete the crane operation. Electric control system takes several protection measures to ensure a highly safe operation, such as short circuit protection, limit switch, overload limit and voltage protection. In addition, the gantry crane can be designed with different spreaders such as hook gantry crane, grab gantry crane and electromagnetic gantry crane so as to be applied in different workplaces. The design of our 2 ton gantry crane has strictly complied with all relative standards and regulations. It is also manufactured under strict inspection and quality control to guarantee a superior quality product. 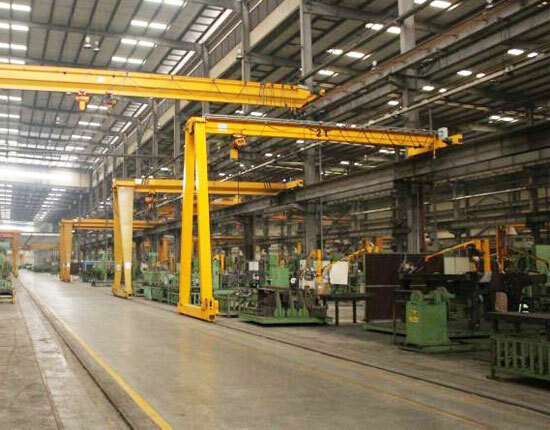 We have been engaged in designing and manufacturing material handling equipment for several years, including overhead bridge crane, gantry crane, jib crane, port crane, electric hoist and winch products. We make great effort to improve our products and offer best services to our clients. Our goal is to solve material handling problems and create great value for them. Technical support and service. We have experienced technicians and engineers in our factory to assist customers to select proper solutions and solve their problems. We also provide installation, inspection and maintenance services as well as an on-site guidance if necessary. Gantry crane warranty. Our crane warranty lasts 12 months, during which we constantly provide dependable service and quality assurance. Our staff are well trained on our products and services in order to better handle customer service. Gantry crane delivery. We guarantee a fast and on-time delivery to match the customer’s schedules, which also makes it easier for customers to cooperate with us. If you want to learn more about us and our 2 ton gantry crane, you can contact us online, and we also welcome you to take an on-site visit to our factory. Looking forward to your arrival!